Local writers are at the center of attention in a new paperback anthology of prose and poetry. 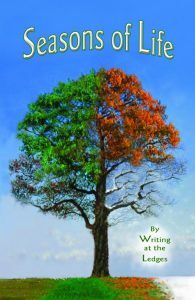 “Seasons of Life” by Writing at the Ledges (Riley Press. $12.99) includes all new works by members of the Grand Ledge-based writers’ group. It’s an invigorating mixture that’s full of poetry, reminiscences, ponderings and fiction by 24 talented authors ranging in age from 17 to 88. This enjoyable collection is arranged seasonally from spring through winter. The cover image by Patrick Reed Designs is sure to attract considerable attention. Many participants may seem familiar as they were published in “Small Towns: A Map in Words,” a collection that came out in 2008. Randy Pearson, whose humorous novel “Driving Crazy” was released last year, makes four appearances, adding dark touches of irony and humor. “Cricks and Flat Pencils” is a brief essay about growing up in rural DeWitt. Alta Reed has her own subsection of 20 pages of reminiscences, including many photographs. Local playwright Phil Kline has two quirky pieces; the group’s co-founder, Rosalie Sanara Petrouske provides six carefully crafted contributions. Carolyn Tody’s “Music of the Wind” focuses on the Great Alaskan Earthquake of 1964, with very descriptive imagery of damage and destruction. K.L. Marsh’s efforts include nine poems or essays. There are also emotional pieces by Lorraine Hudson, who’s written popular children’s chapter books under the pseudonym Judith Wade. Newcomer Abe Khan offers two thought-provoking essays while Jan McCaffrey, author of “Illusions of Murder” provides insights into “Life in a Small Town” and two other selections. Jesse Goldberg-Strassler, the radio broadcaster for the Lansing Lugnuts, showcases five memorable pieces, including “Off Air” a poem that evokes fond memories of Ernie Harwell’s broadcasting. “The Year Santa Got Stuck in My Chimney” is a funny short story by 17-year-old Grand Ledge High School senior Shelby Pontius; Donnalee Pontius proffers two striking poems. East Lansing resident Alan Dennis Harris appears with a funny short story and two poems; Sunfield author Jeannie Kirchen is represented by five poems and an essay. Haslett author Carolyn Nye-Shunk and Okemos writer Karen Marie Duquette are among other writers whose works are included. Ray Walsh, owner of East Lansing’s Curious Book Shop, has reviewed books regularly since 1987.